When Josh and I started dating in 2007, it was during the dark ages before smart phones and easy texting were a thing. Facebook was still an internet baby and Instagram didn’t exist. And since I was living in Minnesota and he was in Texas, we communicated via lengthy, late night chats and long, sappy love letters. When we had the chance to hang out in person (which wasn’t often during our long-distance dating relationship), we smooched at red lights (and told ourselves we always would) and danced to Michael Buble in the candlelight after a fancy dinner. And somewhere between 2007 and 2019, much that romance got buried under years of finishing school, three babies, late-night feedings, mounds of diapers, the daily grind, yoga pants, and paying bills. 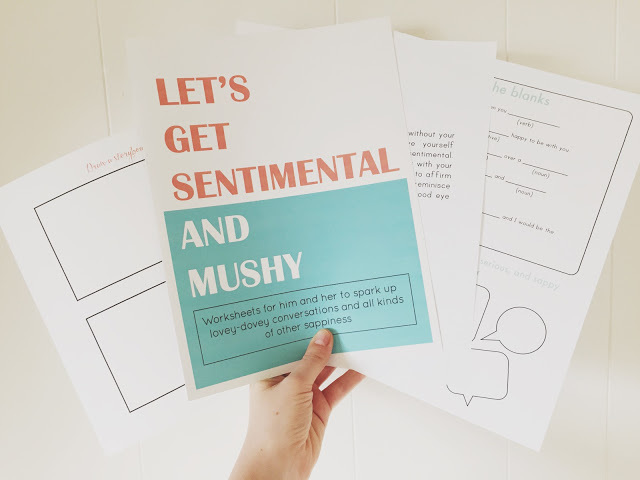 So, a few years ago, I created this little resource to help spark some of those sappy, gushy feelings and reconnect with your spouse. Thanksgiving is just around the corner, and one of our favorite Thanksgiving traditions is sending thank you notes to some of our loved ones. This year I decided to mix up the tradition a little by making our own Thank You cards. My toddler loves Daniel Tiger, and I have found Daniel Tiger's “Thank You Day” episode has really helped her raps the concept of what the holiday is all about. In the episode, Daniel's family journeys to the enchanted garden where they hang their Thank You cards on the “Thank You Day” tree. So we decided to make our own “Thank You Day” trees for our Thank You cards. Using a black fine-tip marker, draw a bare tree trunk on the paper. This can be as fancy or simple as you want. If you have older children, let them draw the tree. Then have your child dip their thumb in ink and then press it on the paper. These are the leaves. Repeat until there are several leaves on the tree. Write a note of thanks inside and send it to a loved one. Who might you send a thank you card to? What ways could you adapt this activity for your family? ps. Thanks for sharing Kayla! Snail mail really is so fun to send! If you are looking for another fun activity to do with your kiddos this season, check out the free gobbly cute turkeys and thanksgiving verse cards. This spring we bought a vintage pop-up camper. She needed a *little* more work than we anticipated, but this weekend we'll take her on her maiden voyage (and hope she doesn't leak!). Pre-kids, we camped often and loved it. But this is our first camping trip with the kids--so I'm excited and a little nervous too! With camping + nature on my mind, I thought it was time I shared another free resource with you guys. Whether you are exploring your backyard or in the thick of a wild forest, getting outside with your kids can be refreshing and fun! If you are enjoying learning about nature, be sure to check out this post and download a free set of cute craft/play dough mats. It's often easy to think that teaching our kids spiritual concepts should be button-up and serious (at least I certainly don't want to make the Bible or God seem silly). However, if using donuts to remind kids to "donut worry and pray and give thanks" helps them remember to go to Jesus when they are worried or afraid, then a little creativity and Bible learning can go hand-in-hand. These printables are super simple to print and use. We used watercolors, well, because clean up is the easiest ;) However, you could decorate your donuts with felt pieces, glitter, glitter glue, paint, markers, or other fun materials. The sprinkles are easy to cut out, but of course, you could also make your own with card stock or construction paper. I hope you enjoy this kit as much as we did and also that it helps you teach your little ones (and remind yourself!) to go to God in prayer and thanksgiving when they are worried or anxious.